This is a photo of the gate entrance at the Triangular Field. 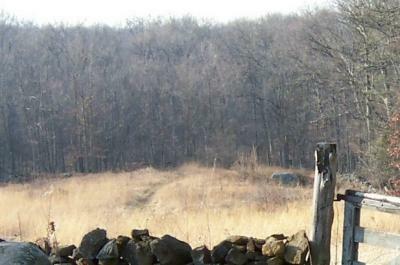 It is one of the most haunted areas of the Gettysburg battlefield. If you are not familiar with this field you can do a search on the Ghost of Gettysburg Triangular Field. This picture was taken Jan. 3rd, 2003 using a Kodak Easy Share digital camera. It was a very mild winter day, so I decided to take a trip to the Gettysburg battlefield with my daughter and son. We live very close to Gettysburg. We decided to visit the Triangular Field but nothing really seemed out of the ordinary that day. We were the only people there. After walking around a bit we left, and I took this picture after we got out of the field. It's of the gate area looking into the Triangular Field. To the left side of the gate where the stone wall dips..look down the field towards the woods. I see an apparition of a man walking towards the woods and I also see a big face of a man in front of the trees to the left side of that big boulder. The trees right behind that look mighty strange too. I showed this picture to others and they can see it too. This was zoomed in and cropped from the original photo so you can see it better. I'd like to know if you can see what I'm seeing. I see the face but not the man walking towards the tree line, sorry. But I can't. I was up in Gettysburg last Saturday around 6PM and this area and Devil's Den was packed with people. Wonder how many ghost sightings there were. I am going up again tomorrow night. There are multiple faces in the top of the trees, large faces. There are also two soldiers in blue unforms standing at the left and right of the photo at the base of the trees. Can't see anything in this photo,sorry. I know it's at Gettysburg, but that doesn't mean there's going to be a ghost in every one of them. A full out battle is what I see. In the back there is actually cannons (two) and there are soldiers too, one has either died or is dying. You conviced my teacher! (hard to do) we all see the man, but you actually caught full figures in battle! The arrow is pointing at a cannon ball that has been fired and the smokey look in the trees is the smoke from the cannons. Thanks for sharing it! I've seen this picture before. I do see the man on the hill, but what you think is a face on the left, is actually a cannon, theres 2 cannons in this picture, and what looks like the nose at a distance is actually another soldier firing the cannon and right on the hill literly right next to the hill is a soldier that has either died or is dying, all the people are soldiers, and the smokey trees are the smoke coming from the cannons. The arrow even looks like it's pointing directly at what i think is a cannon ball that has already been fired. Everyone in my Civil War class saw this picture and we discussed it for at least 30 minutes trying to figure out what was in the picture. My teacher who is a real critic on ghost and spirits even thought this was amazing. We all including our teacher, came to the same thought, you caught a full out battle going on! Way to go on convincing our teacher! I looked closely at the picture, and I do see the man in the center, but what the big face on the left really is, a cannon. I've actually seen this picture before, and if you look a little closer, behind the soldier, there is another cannon, and the arrow that is in the second picture might be pointing a the actual cannon ball being fired out. When you say the trees look weird, my friends and I think its the smoke from the cannons, looks like to me you caught a part of the battle. I've learned so much about Gettysburg and the Civil war, that I know it's the soldiers, still fighting. Sorry, can't see any ghost in your picture. Last year, I took several 10 second exposures facing the Sachs Bridge with not one orb or any other objects just solid black negatives. While at the bridge, a young couple took some pictures and they swore they both saw a ghost! Then, I've always been a skeptic so maybe they just don't 'expose' themseves to me. I'll try again in November while attending the Remembrance Day and head for the Trianguler Field with my D90. I don't see anything but blurred trees. As a Paranormal investigator with the Pennsylvania Paranormal Investigations.we are located In Harrisburg Pa, I looked at your picture and I can tell you I have been all over the different part's of the battlefield. And what you have is a very good picture.But you will always have skeptics out there.We face the same situations when we do investigations. Keep on taking picture's because that is your proof of what you actually saw.If on your next visit if possible use a DVD camera. That's the bomb. Who found that? I bet that if I was to go there with you brother with his camera, all would function correctly! As much as I want to see, hear and experience whatever everyone is experiencing on these battlefields.....it never happens for me. Perhaps I scare them! It's amazing how so many people can stare at this photo and come up with a different view! I just think the quality of the photograph is very poor and distorted to the point that some are "seeing" lots of things that are not even there. If we keep this photo posted for a bit longer, I'm sure that others will "find" other orbs as well. Sorry for being negative but let's face it....we can pick apart alot of grainy pics to depict what we think are orbs. I have many photos with "orbs" in them but I believe it has to do with the camera, lighting or dust. I'm not sure what I see. There appears to be something transparent there, near the bottom left and more toward the right is something much taller. If I stare at anymore ghost pics, I'll lose my eyesight. I've no doubt there are spirits there, with all those horrific and tragic deaths that occurred. It's sad to think that the souls of those men may be confused and wandering the earth rather than moving on. I hope it's just residual energy. I was in Gettysburg last week and took a series of pictures and actually got a little excited after seeing a photo I took near the Pickett's Charge area. I saw what appeared to be an orb in one of the photographs. After seeing several more with the orb in the same place I soon realized that it was a rain drop on the lens. What a bummer! All I see is what appears to be an animal in the picture. I am a member of the Sons of Confederate Veterans and I love all of this war history. I had three kin people who fought in Gettysburg. Hard for me to say if what i see is simply my brain trying to fit the images into an accepted structure or of something is really there. I am well aware of this field and recently took a few pics at night with very subtle orbs (not the numerous big bright ones which clearly are dust reflected in the flash). If I let my mind run incredibly wild, I can visualize all kinds of things in this photo. But to be honest, I really don't see anything here. I've been there day and night and took many pics. Nothing revealed....sorry. I see something. Im just not sure what it is and for all of you Gettysburg ghost hunters out there, check out Big Round Top. That is where I got my one and only ghost pic with a good 20 faces in it. Anyone recently report anymore ghost sightings while in Gettysburg? I'd like to see some. Sounds great, Ken! Please do share. Hi everyone. I can see a hat along w/a uniform and face. I've been to Gettysburg a dozen times. And I hope to catch something one day. I may go tomorrow. I'll post anything that I might feel worth while. All I see is some overgrown brush. I added my pictures on the Ghost Pictures page under the titles of Codori Farm and Little Round Top. Where can I go to see these clear pictures from November 8 & 9th? So, Katie, if you and your fiance got such spectacular shots, why didn't you post any of them here so we could see them? That's what this site is all about, sharing paranormal photos. Hope you'll post them soon. There are blurred mists and hazes in all of the pictures (225 of them) and the day was perfectly clear and sunny. I am still amazed at the clarity of the images I caught. I've visited Gettysburg 3 times in the last 10 days to take pictures all over the battlefields. You name it, I've been there. So far, none of my pictures have revealed anything paranormal related...at least that I can tell. Not even an orb. I recently went to Sachs Bridge which has a history of sightings, etc. It was a bit eerie being there alone. I took video and stills. While I was there, a family of 3 drove up, got out of the car and started over the bridge but did an abrupt about face and went back to the car and sped off. That seemed odd to me. They took the time to drive there, then disappeared after being there for about a minute. More to report later. I was at Gettysburg yesterday (11/3) and took a series of photos. I haven't gotten them off of my camera yet but did take many from various parts including the WHEATFIELD and DEVILS DEN. If I find anything I will post them. I see the big face, but not the man walking towards the woods. I was just up in Gettysburg last weekend and took a ghost tour. I must say, it was very good. And although I'm more of a skeptic about ghost sightings, I did photograph something strange and unusual while taking the tour. Now I've never been to the Triangular Field before (I don't think) but I plan to visit this coming Monday (11/3/08). I will be taking some pics. Any tips on other areas that report a high probability of ghostly apparitions? Please help me with seeing these purported ghosts in this photo. I can conjure up images all over the place but really, does anyone really see any ghosts in this photo? Really. Another ghost you cut off with your circle. You have his head and chest circled but the not the rest of his body because you looking in the trees. Look about 1 inch to the left of the post in your first picture and youll see a full ghost standing there. He also has another ghost walking towards him. Look about an inch from the left side of your first picture and I see the other ghost standing sideways, walking towards the other ghost. I think I see another ghost between those two, but I can only make out its face, not the body. Try as I may, I'm just not seeing any type of apparition on this photo! Granted my sight may not be what it once was but I don't see anything unusual here. I'm going to Gettysburg on Saturday night (10/18/08) for a ghost tour and plan to spend the day. I will try a little of my own ghost seeking earlier that day. Hi, Ruth. Took another closer look at your photo. Did you notice if there were houses back there in the woods? I can clearly see a few houses when I zoom in closely. To the right is where I see the apparition of a man in a dark uniform, a woman in long dress and another man in a white shirt and dark trousers standing by a tree. Amazing that we can all look at the same photo but have different interpretations. Can you go to any of these haunted battlefields at night, or are they off-limits and closed down after a certain time? When I used Windows Picture and Fax viewer to zoom in, I distinctly saw a figure with a white top and dark trousers. He looks like he's peaking around the tree. After closer scrutiny, I spotted another figure to the left of him with an all dark uniform, wearing a hat, and a third figure sitting down(? )in between the two of them or leaning against a rock in what appears to be a long, dark, full dress(?) Now, you've got me curious. Does anybody else see what I think I see? I'm glad that worked for you GrayReb. I don't see anyone wearing white shirts and dark pants in my photo though. And there was absolutely no living person in the field when I took that photo. If there had been, I would have said that. In my circle I see a shape of a man that is slightly transparent and not fully formed. He is missing a leg or perhaps it just wasn't formed yet when the photo was taken. He was the first image I found when I first looked at my photo. I followed the white streak that lead right into him. Still in the circle in front of the trees, there is a tall stalk of weeds and I see a large face right beside that. And many forms and faces I see in the trees that I don't have circled. I'm not trying to convince anyone or make up a story about this photo. What would I have to gain from that? Either people can see what I'm seeing or they can't. Simple as that. I'm just curious as to how many other people can see these images. I have taken many photo's at the Gettysburg Battlefield over the years, and the only photo's I have with strange images are the 2 that I listed on this website...both taken the same day at the Triangular Field. And I have studied all my other photo's carefully. So I know it's not my imagination. Thanks Ruth. I did what you suggested. I can see faint outlines of a couple of people; they all seem to have white shirts and dark pants, and don't seem to be wearing uniforms, though. Not yet convinced they're apparitions; tourists walking around perhaps? If you have Windows Picture & Fax Viewer it will enlarge the photo. You can right click to save photo in your pictures. Then after the photo is saved in your pictures, right click the photo again and choose Open With..Windows Picture & Fax Viewer. It has a magnifier you can use to really enlarge photos. I don't know if you have that, but if you do it works great. Hope you can see what I'm seeing. Also study the trees. There are images and faces in the trees that I didn't point out. Maybe not everyone can see this, but I know I do and a few others see it too. Does anyone know how to enlarge the photo so the "entities" can be seen? A magnifying glass just isn't what I had in mind. Is there software you can download to zoom in and get a closer look? Appreciate any advice or link. What do you see? I don't see anything. I don't see what you are talking about! I don't see anything! There appears to be a line of entity in your photo. Very interesting! That is so freaky. There are shapes of people in those trees! Thanks to all that have commented on this so far. I'm very happy to share this photo and hope to get more comments. I appreciate hearing from all of you to see how many of you can see these spirits. Even if you can't see them, feel free to comment. There are more then I mentioned. If you study the trees you may find them. Using a magnifying glass I can see 6, maybe 7 people images! Which would make sense, because this was a battlefield. Thank you for sharing it with us! OMG I can really see it! The man is very faint and it looks like he only has one leg. I think I see a face beside a tall weed too. Under your arrow in the trees, it looks like a tall man holding a candle or light of some type. Is this for real or am I just seeing things? Wow! WOW!! I can see SEVERAL eerie forms! This is SO cool! Where you have it circled - I can clearly see a man walking! And to the left of him - with a magnifying glass you can see the white form of a man sitting. But, straight on, up in the trees - is a very large face?! I just wonder - when you're at that field - can you "feel" them there?! I've heard people say they can smell them, or hear them, at times. Ah, not me! I'll just stay home and read about it! Not able to see what you are describing, although I don't doubt you see something. I've been there many times myself. Will have to try to zoom in on the area you indicated somehow to get a better look.